Drexel Snapshot: What Can Venetian ‘High Water’ Teach Us About Climate Resiliency? 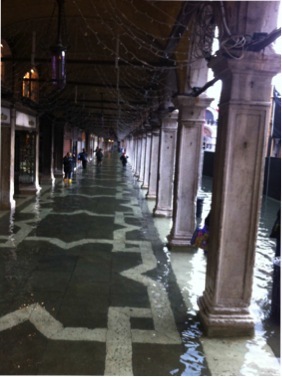 Flooding in Venice during “agua alta” phenomenon. Drexel environmental engineering professor Franco Montalto, PhD, is on sabbatical in Venice, where he’s getting a close look at the effects of climate on the urban ecosystem. Montalto, who designs, installs and monitors green infrastructure as part of his research, describes his encounter with Venice’s acqua alta phenomenon during his first week there and how the locals have adapted to deal with their “high water” situation. Read Montalto’s full story on The Nature of Cities blog. News media interested in speaking with Montalto should contact Britt Faulstick at bef29@drexel.edu or 215.895.2617.